Lauren Pahl and Guido Rodrigues left their cocktail hour to say hello to Squirt, a horse that lives in a barn on the property of Knowlton Mansion. There she was again, the happy woman with the gorgeous smile, laughing with her friends at Throwbacks Bar & Grill. That night in December 2012, Guido was determined to meet her. The bartender delivered drinks to Lauren, her sister, Kelly, and three girlfriends, coworkers from the nearby Delran Chili’s, where then-classroom assistant Lauren had a part-time gig. They often unwound at Throwbacks afterward, but gift drinks were something new. The cadre followed the bartender’s finger to their benefactor. Lauren and Kelly left the table to join Guido at the bar and thank him. After a brief conversation, he asked Lauren for her phone number. Text talk ensued the following day, and a few days later, Lauren invited him to join her and some other friends at a different bar. Lauren and Guido, who was then head of operations for a hotel management company and who had moved to Delran from California two years earlier, soon focused on each other. They talked. They flirted. At the end of the night, he asked her on a real date. They talked about work and sports, about growing up in Delanco (Lauren) and São Paulo, Brazil (Guido), and about the importance of family. They saw so many things eye to eye. Guido remembers thinking he had found the one, right person. Lauren also had a good feeling about things, but she wanted to take it more slowly. Well, sort of. They didn’t declare themselves boyfriend and girlfriend until summertime, but all winter and spring they saw each other about every other day. “After three months, I met her parents in the parking lot of a Sam’s Club,” Guido said. Invitations to Pahl family events followed, as did the aforementioned bequeathing of the boyfriend/girlfriend titles. Six months after they met, they rented a Palmyra apartment together. “Go look in the bedroom,” Guido said. They hugged. They cried. They FaceTimed her sister in Hawaii. Guido Rodrigues and Lauren Pahl exit their wedding ceremony through autumn leaves. The couple also called her parents, Terry and Diane, and his, Guido and Regina, to share the joy, but this was no surprise to them. Guido had previously called his parents to let them know the big step he was taking. He had gone to Terry and Diane’s house beforehand to seek their blessing, and to invite them to a post-engagement dinner for four at the Madison Cafe in Riverside. Two months later, Guido, who is now 42, and Lauren, now 33, bought their Delran home. In July 2018, after two years of prep work, Guido launched his own hotel management company, GLF Hospitality Group. GLF represents the words Guido, Lauren, and family. Lauren is the regional sales manager. The leaves on the trees — and ground and chairs — had changed into gorgeous colors. Alisha Simone of Elegant Event Flowers placed eucalyptus and blush and burgundy flowers on the arbor. 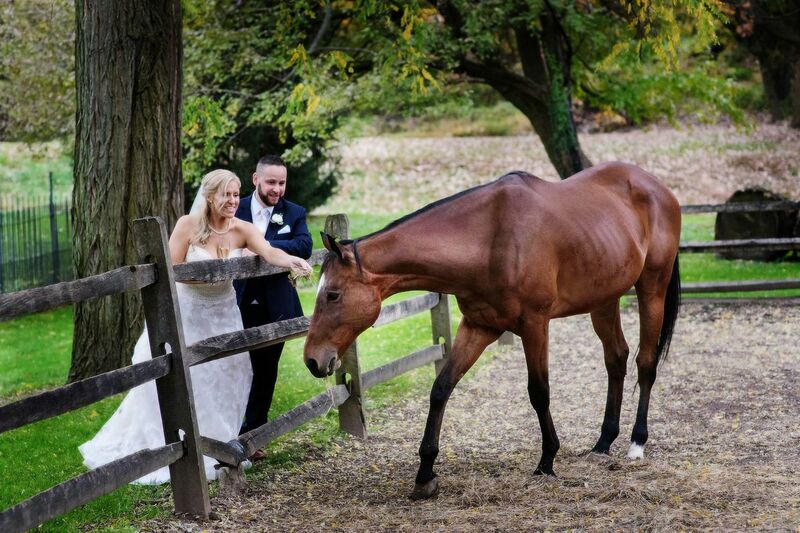 Even the horses were out, furthering the rustic feel Lauren sought. Father of the bride was not Terry’s only role. He and Guido have become close friends, and he was a groomsman. The ceremony included a family blessing. Guido’s parents, who live in Brazil, couldn’t attend. But his sister Geisa; his cousin and best man Davi; Davi’s wife, Vanessa; and their daughter, Isadora, stood with the bride’s parents and sister and vowed to do everything within their power to support the couple and their marriage. “We had kind of a lot of speeches, and they were great,” Lauren said. Speakers included her dad; best man Davi; groomsman Justin; maid of honor and bride’s sister Kelly; and matron of honor and bride’s friend Vicky, who is married to Justin. After the couple’s first dance, Guido danced with Lauren’s mom, and Lauren danced with her dad. Guido Rodrigues and Lauren Pahl wear fun glasses as they are introduced into their wedding reception. A bargain: Eleven years ago, before the bride and groom had even met, DJ John Estrada had provided tunes for Lauren’s cousin Maureen’s wedding. “He was just as engaging as I remembered, and he gave us a very fair price,” she said. Photographer Rebecca Barger talked with the couple several times before the wedding, and then showed them key pictures as she took them. “She wanted to be sure we got all the settings we wanted to get. She really cared about our pictures,” Lauren said. The splurge: Lauren and Guido love wine, so when they realized the Knowlton offered a private wine-cellar tasting for guests, complete with complimentary cheeses and chocolates, they couldn’t say no. A week on Oahu, Hawaii, including hikes in Waimea Botanical Gardens, fresh fish dinners with gorgeous views of Waikiki Beach, and a deeply moving tour of Pearl Harbor. Officiant: The Rev. Debra May Cerra, parish associate at Poland Presbyterian Church, Poland, Ohio. Food: Conroy Catering Co., Philadelphia. Music: DJ John Estrada, Best of Times Professional Disc Jockeys, Souderton. Photography: Rebecca Barger Photography, Jenkintown. Videography: Video Theater Studios, Allentown. Flowers: Alisha Simone, Elegant Event Flowers & Decor, Moorestown. Dress: Casablanca Bridal, purchased at Kay Bridal, Maple Shade. Hair: Up Your Do! by Jill Kozar, Starlit Salon, Jenkintown. Makeup: Dylan Michael Cosmetics by Cindy Singer. Transportation: David Thomas Transportation, Philadelphia.